Founded in 1990 by its director José Galván, Voz en Punto is the a cappella vocal group with the most brilliant international projection in the history of Mexican music. 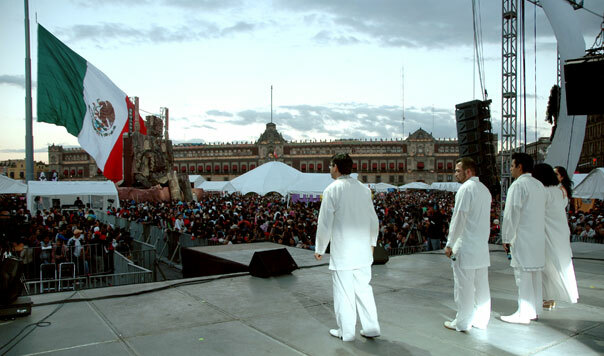 With an original scenic proposal that gives testimony to Mexico’s rich musical heritage, and utilizing the most incredible musical instrument which has always been at human beings’ disposition—the voice—Voz en Punto burst onto the musical scene conquering audiences who they then proceeded to “madden and send into ecstasy and delirium…” as various press critiques attest, from countries as varied as the U.S., France, Switzerland, Germany, Russia, Rumania, Austria, Finland, Spain, Greece, Holland, Egypt, and Japan (among others). The ensemble has been equally honoured by having received special invitations from such emblematic figures of World vocal music such as Bobby McFerrin and The King’s Singers, as well as by important orchestras like the Mercury Baroque Orchestra, the National Symphony Orchestra of Mexico, and the Salzburg Camerata. It has also performed alongside icons of Mexican traditional music like the Marimba Nandayapa ensemble and the Mariachi Vargas de Tecatitlán. In theatrical productions, it has shared the stage with important Mexican figures such as Mario Iván Martínez and Astrid Haddad, and it also performed the soundtrack in the award-winning 2007 animated feature film “La Leyenda de la Nahuala”. And finally, First Place wins for Mexico in the categories of Folk and Viceregal Music, in the Tribunes of Latin-American and Caribbean Music, CIM-UNESCO, in 2002 and 2004, respectively.